Some results of my implementation of the articulated ICP paper by Shachar Fleishman . Iterative Closest Point (ICP) is an algorithm employed to minimize the difference between two clouds of points or between a point cloud and a model. In this case we align a point cloud with an articulated model. 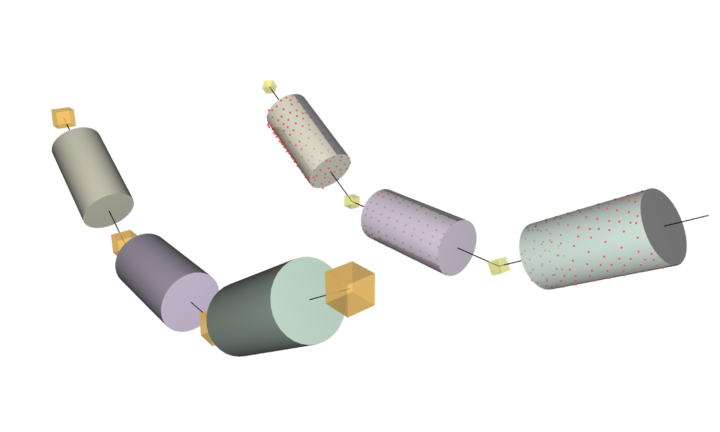 The structure of this model exists out of 3 rigid cylinders connected by hinge joints, just like a finger. An interactive model is used to generate a 3d point cloud. This model is rendered to a render target in order to generate a depth map, from this depth map the 3d point cloud is constructed. The video below demonstrates a user interacting with this interactive model. The generated 3d point cloud is drawn in front of it. Then we can try to fit an articulated model to this 3d point cloud, as seen below. Only 5 icp iterations were used per frame. Fleishman, Shachar, et al. “ICPIK: Inverse kinematics based articulated-ICP.” Proceedings of the IEEE Conference on Computer Vision and Pattern Recognition Workshops. 2015.